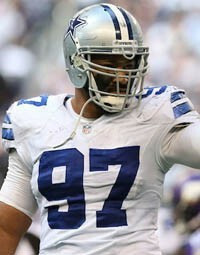 Jason Hatcher was born July 13, 1982 and is a defensive end for the Washington Redskins of the National Football League (NFL). He played college football at Grambling State University, and was drafted by the Dallas Cowboys in the third round of the 2006 NFL Draft. Hatcher was drafted in the 3rd round (92nd overall) of the 2006 NFL Draft by the Dallas Cowboys. His selection at the time was questioned because of his lack of production in college, but the team was high on his athletic ability and potential for their 34 defense. As a rookie, Hatcher played in 14 games, missing two with a sprained ankle. For the season, he recorded 13 tackles, one for a loss and 2.5 sacks. In 2007, he played in all 16 games and recorded 35 tackles, three for losses and two sacks, while forcing one fumble. In 2008, Hatcher recorded 36 tackles, one for a loss, one pass broken up and one sack. In 2009, he played in all 16 games and recorded 29 tackles, one sack and one pass breakup. For the most part of his career with the Cowboys he was a reserve player (his first start was in 2010) and seen as a disappointment, until he resigned with the team in 2011 after not receiving much interest in the free agent market. That season with the arrival of defensive coordinator Rob Ryan, he established himself as one of the team starters at defensive end, ahead of Marcus Spears and improved his overall play, compiling a career high in tackles (36) and sacks (4.5). In 2012 he was the Cowboys best defensive lineman and the only one to start all 16 games, on a defense decimated by injuries. He also improved his production, registering 4 sacks and career highs with 51 tackles and 29 quarterback pressures (second in the NFL among interior linemen). After eight seasons with the Cowboys, Hatcher agreed to sign with the Washington Redskins on March 13, 2014. The next day, he officially signed a four-year, $27.5 million contract. Football stars such as a Jason Hatcher have taken the game to new heights by excelling at their respective position. The booking agents at AthletePromotions can assist with Jason Hatcher speaking engagements or appearances from NFL stars. We have years of experience in booking gridiron greats for keynote speeches and autograph signings. Hiring a football speaker like Jason Hatcher is not a hard process. Our agents can provide availability, fees and all costs associated in bringing out a successful football star to your next corporate event. We can find Jason Hatchers agent to make this booking happen. A Jason Hatcher appearance will add energy to your upcoming event and reward employees, customers and clients.Most likely, football fans and corporations can find Jason Hatcher's official website, charity involvement, Twitter account, representation, publicist and management info at www.Jason Hatcher.com.